I visited on a Saturday around 12pm, just half an hour after they opened and the queue had started to grow! Most of the customers were getting it to go and they have about 4 staff all busy, doing different tasks. The old lady at the front takes the order, she was friendly and most of the bottle neck was from the old man having to scoop up the soup and meat. For $4 you get 10 beef balls.. I was happy with that! The meat tasted good and the sauce was yummy too! However the soup was too sweet for my liking. I think they must have added some sugar to it, despite them boiling soup for extended periods. Would I be back? Only if I'm in the area but there's also a lot more food in this same hawker centre that might entice me to come back and at the same time grab some beef noodles! 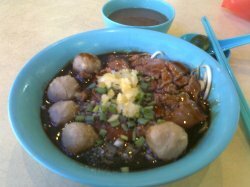 Excellent Beef Noodles @ Toa Payoh! This is my ‘go-to’ place for traditional Hainanese Beef Noodles. They were previous from the Cuppage Hawker Centre, and shifted here many many years ago. I rediscovered them years ago and after eating at this stall, I have returned many time over. 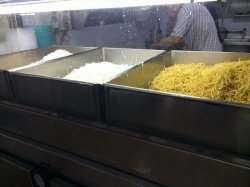 You have a choice of noodles (Chor Bee Hoon - Thick Vermicelli/ Bee Hoon - Thin Vermicelli/ Yellow Noodles/ Kway Teow – Flat white noodles). My favourite is the Chor Bee Hoon - Thick Vermicelli. 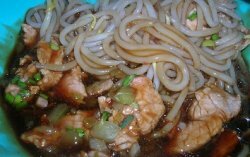 You have an option of dry noodles which comes with a thick starchy brown sauce or noodles with soup. Most times, I will order the sliced beef and Beef Ball option at $4. If I am hungry, I will go for $5. My lunch partner couldn’t resist the tendons and ordered a tendons with soup, for sharing. I ordered the dry version - sliced beef and Beef Ball option. The thick starchy brown sauce was full of umami, with soy and beef flavour. The beef was well cooked and the beef balls were nice and had a good bite. The tendons were also nice and soft. There is always a queue here and you take about 20 minutes to get to your turn. But the wait is well worth it. I have a good friend that loves beef noodles just like me and the previous time we were here, the stall had already sell out their beef noodles! At that time it was already close to 3 pm. This time, we went there around 12 pm and join in the queue immediately! We both ordered the dry beef noodles which consist of beef balls and beef slices. The beef slices were tender but the beef balls were so-so as they had a generic factory-made kind of taste. The noodles were totally soaked in the gooey and starchy sauce which I like it to be that way but taste-wise, it was nothing fantastic but decent enough. Unexpectedly, the soup was the best!! It was robust and so full of flavour! I am so going to order the soup version next time! This has got to be one of the best beef noodle I've ever had! Go for the dry version and love the soup which was thick like stew. Yes, it was very salty but it was so tasty, flavourful and thick. Plus it was served piping hot. Go early as the stall is popular and the long queuing time is worth it.They have just the soup with rice too. This has got to be one of the best beef noodle I've ever had! Go for the dry version and love the soup which was thick like stew. Yes, it was very salty but it was so tasty, flavourful and thick. Plus it was served piping hot. Go early as the stall is popular and the long queuing time is worth it. They have just the soup with rice too. Can you believe I actually queued for more than an hour for a bowl of beef noodles? The appearance of the beef noodle was a tad disappointing , just beef & beef ball no fanciful ingredient. It looked pretty normal, and I swear that I will never gonna queue for so long again. Thankfully, it was really tasty. The sauce was sweeter than the usual one I had tried before. A natural kind of sweetness that goes very well with the noodles, which will make you yearn for more. The meatball didn't appeal to me but the beef slices were good, cooked to perfection. The serving of the beef slices was generous too, as I find myself with lotza beef slices even after finishing my noodles. The newly painted Kim Keat Palm Market & Food Centre, located at At 22 Lorong 7 Toa Payoh, just reopened for business again. One of the must-eats at Kim Keat Palm Market is the Hai Nan Xing Zhou Beef Noodles (海南星洲牛肉粉)! After trying this, I'm convinced that I like beef better than chicken - but it is rare to find a place that is able to cook beef well, and at an affordable price too. This stall has a very long queue, but that is a good indicator of quality hawker food! You can choose the noodle type as well as soup or dry version. For the dry version you will have a separate bowl of soup base. I can still remember the vivid taste of the soup, the noodles and the beef in my mouth even after two weeks. This goes to show how much I love it. The soup is thick, richly flavoured with the beef taste, and a little peppery. The beef is super tender. This is a huge plus point for me because I usually avoid beef because I always needed to chew on it multiple times before it is soft enough. But this is immensely enjoyable to bite, and the beef flavour is strong without being overwhelming. The beef meatballs were also adequately springy. I squeezed a dash of lime which gave the soup another twang to its layers. Love it! I'm getting really hungry just looking at the photos and I can almost taste it in my mouth right now. 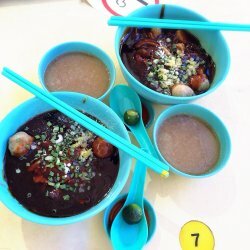 Bringing "mouthwatering" to a whole new level... if you live in Toa Payoh area and have yet to try this, you know where to go for your next lunch place. This place is worth many revisits... if only I lived nearer, this could easily be classified under my "comfort staple food". Do note that it is closed on Mondays. 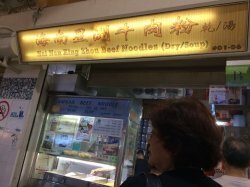 I was told that this is the best Beef Noodle that you can find in Singapore. I only had my fix once so I give this a try. There's 2 types of Beef Noodles to try out for. The dry and soup version. Honestly the dry beef noodles kinda turn me off. So i opted for the soupy one with Kway Teow. They have 3 different bowl serving, if im not mistaken, they have $3/4/5. I bought the smallest portion, just in case i didnt fancy it. I think you can ask for the beef meatballs and the bones as well but of course, there's extra charge. We were there during lunch time, and the q had like 5-8 people but we only waited for not more than 20 mins. Maybe i came prepared with zero expectations, but i was surprised how tasty and rich in flavor the soup was. I added the whole serving of chilli sauce in it with a bit of lime to get more kick. The beef slices were tender and was easy for me to chew. I was impressed by this tiny portion of bowl. I rarely finished up my lunch but this time, you cant find any noodle or let alone soup left. Yes it was that good, for me! The sad thing is, i stay all the way at the east.. and this is in the north... but.. if i ever have any friends to show singapore around for, this is one of the first few place i would bring for them to try the local food.. The property agent raved about Soon Heng Rojak at the HDB's basement foodcourt and the Xing Zhou Beef Noodles at the Kim Keat Palm hawker centre so we ditched our plan to eat at Astons at the recently reopened new Safra. The Kim Keat Palm hawker centre is big so we asked a passerby for directions to the highly recommended beef noodle stall. He said we could just walk around the perimeter of the hawker centre and look out for a Q that snakes out of it. True enough there was only one such Q & we went to join it. Let's just say that Singaporeans will always be happy to Q for freebies, condos & good food. Although the Q was long, it moved at a reasonably fast pace. The stall is managed by a team of three senior citizens well past their retirement age, so kudos to them for toiling briskly, patiently & steadfastly to serve the Q of hungry customers. 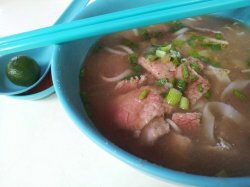 Hainan Xing Zhou indisputably dishes out the best value beef noodles in Singapore. The $3.50 bowl of beef noodles was topped with lots of thinly sliced, good quality lean beef that was blanched to perfect timing to seal in all the juices yet remained a touch rare & tender to the bite. The gravy was rich, tasty & of perfect consistency, coating every strand of the thick rice noodles without being too starchy. 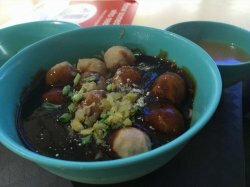 The beef balls were tasty & bouncy too.It is nice to have enough meat to accompany every mouthful of noodles. Full marks also for their hearty, wholesome beef broth which had a robust bovine flavour. The beef residue in the soup is proof that the bovine flavour is derived from cooking lots of beef in the soup which had been kept simmering on the stove over low heat for long hours. This is honest to goodness beef stock with no short cuts. My partner who ordered the beef noodles with the innards also gave his bowl two thumbs up as the beef tendon, stomach & other parts had been painstakingly cleaned thoroughly to rid them of any offensive smells and subsequently cooked just right. While this stall is hardly as famous as the Hock Lam Beef Noodles at Raffles Place which I find rather overrated, it has built up a loyal clientele who make their way back regularly whenever they have a craving for homestyle beef noodles. I am one of Xing Zhou's newest fans. This is another famous beef noodle stall in this food centre. Waiting time can be pretty long if you come during lunch or weekends. 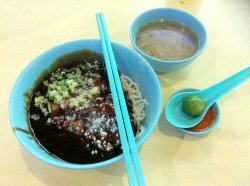 The well cooked thick bee hoon was served in the nicely braised thick gooey sauce. They cooked the beef slices separately to the tender texture and served it with the noodle. A handful of chopped onions was added to enhance its flavor. A bowl of flavorsome soup served together with the beef noodle. This is easily amongst the nicest beef noodle stalls in Singapore. I was there during a weekday, after the lunch crowd so I managed to avoid all the long queues. I ordered the soup version of the beef noodles. The portion of beef slices here is much more than the other stalls which I have tried before, which is one reason that makes me return to this stall again and again for my beef noodles fix. Besides the portion, the taste is also very good. The beef slices are tender and the soup is very good as well. The soup doesn't seem like it is flavoured with msg, but instead, the flavour of the soup is from the ingredients that went into the soup. 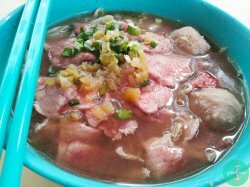 Just the soup and the tender beef slices are good reasons for you to visit this stall, even with the queue during peak hours. The beef noodles are always sold out very fast here and it is usually advisable to be there early to avoid disappointment. The secret weapon for this yummy dish which I suppose will be their thick dark nice beef gravy and also the sliced beef meat in it. The gravy is really thick and sweet with lots of spices' taste in it. Eat with the noodles are really fragrant and delicious. The sliced meat here have been marinated and sliced really thinly which you can really taste that tenderness and soft texture of it. The portion is generous and one bowl is more than sufficient to satisfy you. 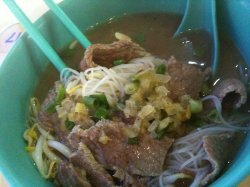 This is definitely one of the best beef noodle in town! Beef is very tender, juicy and soup base very tasty. Combined with the salty vegetables and lime given, it's just perfect. As today is also a rainy day, so a pipping hot bowl of yummy beef noodle soup really made my day! 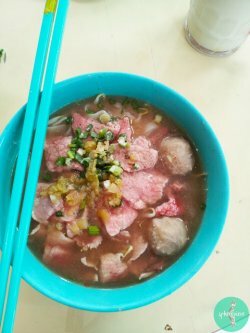 They do sell soup and dry version of just the beef meat or beef balls or combination of beef meat + beef balls noodles @ S$3, S$4, S$5. 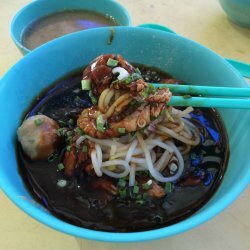 There's also a choice of beehoon and kuay teow for noodles too! Personally i feel it's better than the famous Hock Lam Beef Noodle. Try to avoid 12-2pm lunch time, if not the queue is normally quite long and waiting time can sometimes be up to 20minutes! i love the beef noodles at hai nan xing zhou beef noodles. The noodle is very smooth, quite chewy too. The beef soup or rather gravy is awesome. Very thick and the flavor is intense. The beef taste is very strong making the gravy really tasty. The beef is very tender, unlike some place where the beef is so chewy. You must eat with their chilli, it gives it a spicier flavor. I really enjoy it. 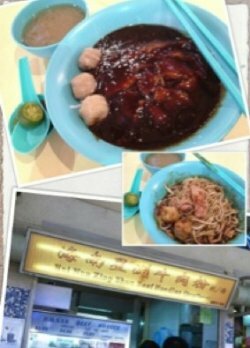 I had tried many beef noddles and i love Hai Nan Xing Zhou after watching on TV how they boil their gravy and soup for many hours and many days and whenever i got the time and urge to eat, i will go all the way and queue patiently. I will always order $6 worth of beef balls,tripe and fresh beef slices and have it dry version which comes with brown thick gravy and a seperate bowl of soup. Mix it with their homemake chilli sauces and lime, wah it's bravo.. 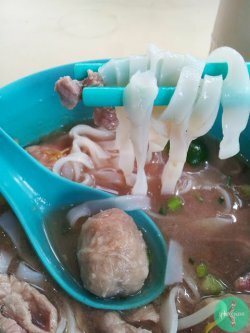 It comes with a bowl of hot boiling secret ingredients soup which is so tasty that you can finish the whole bowl and if you are to look around all those customers who ordered their beef noddles whether in soup or dry, chances are their bowl are almost empty from soup. Be prepared for the long queue though but worth the queue. There is always a long queue at this stall but I would eat there only before the lunch crowd start to join in the queue during weekdays. I've eaten many times & I find it very delicious so I decided to write a short review here. 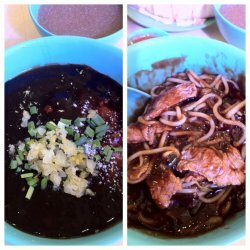 The beef noodle with the thick dark sauce & the soup are really fantastic~!!! The old uncle who serves me is always friendly & polite.